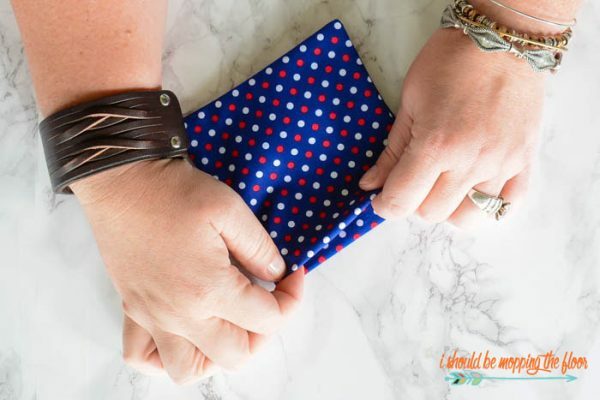 I love these Patriotic Quilted DIY Coasters that Kristi is sharing to kick off my Celebrate Summer Series. 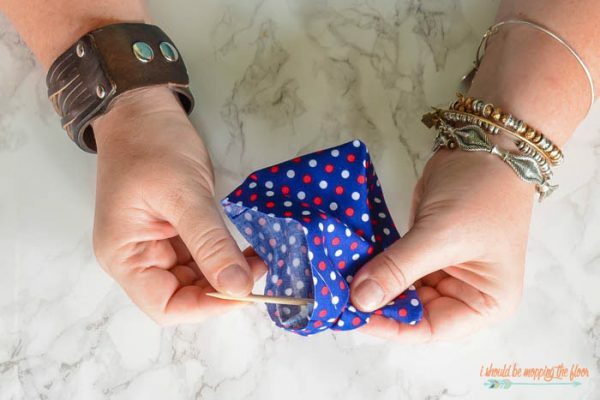 This easy to follow step by step beginner sewing craft tutorial looks like something even I could tackle! 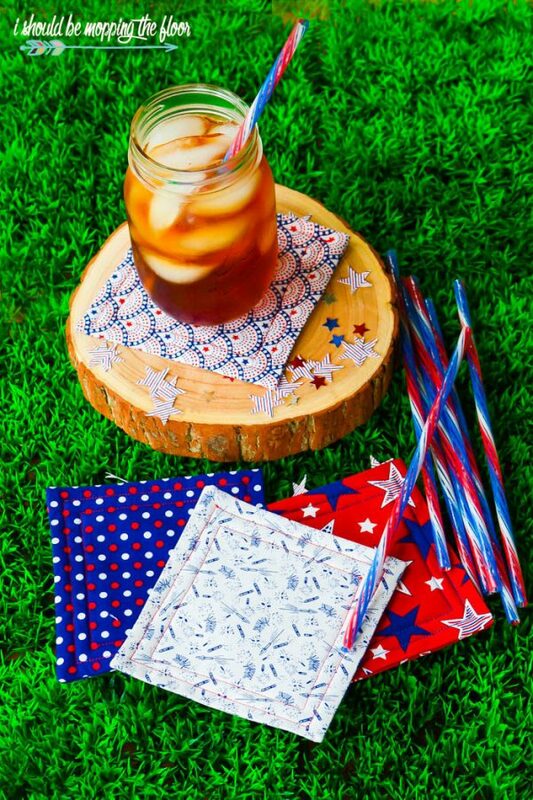 Time to get out that sewing machine and whip up a few 4th of July DIY Coasters! 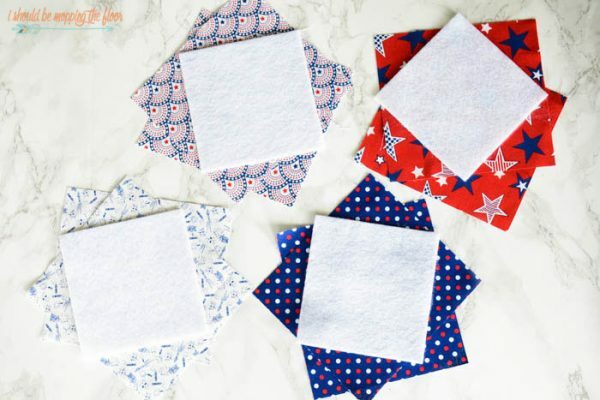 These Quilted Patriotic DIY Coasters make a fabulous hostess gift for all of the summer cookouts you’re headed to this summer. 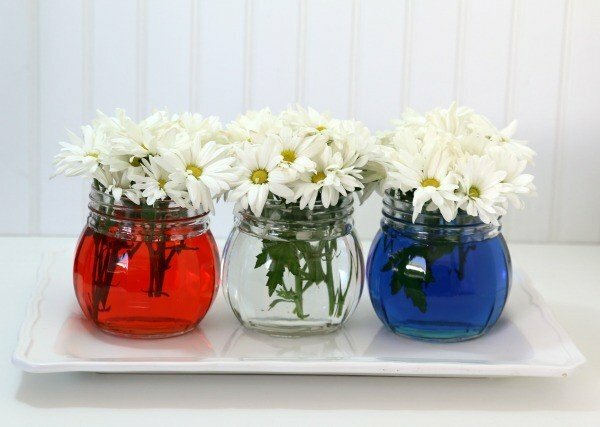 Or make a set to go with all of your red, white, and blue decor. Hi, friends! 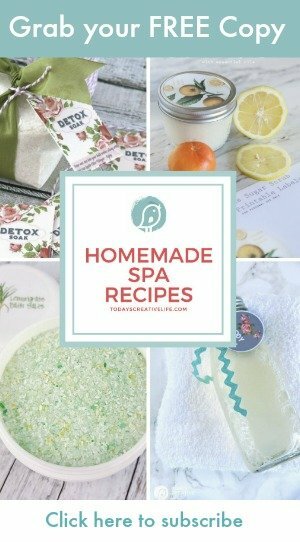 It’s Kristi here, from ishouldbemoppingthefloor.com. 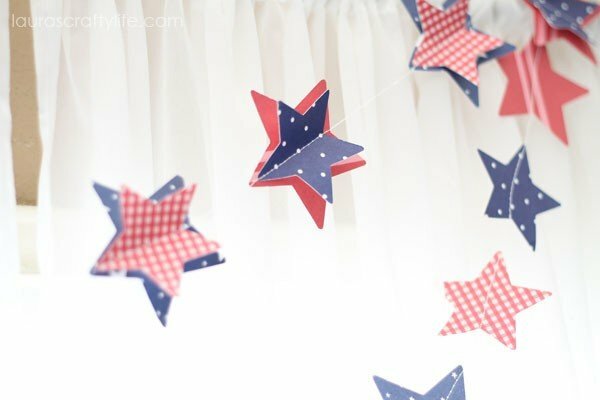 I’m thrilled to be back at Kim’s place with a fun Fourth of July project for you. 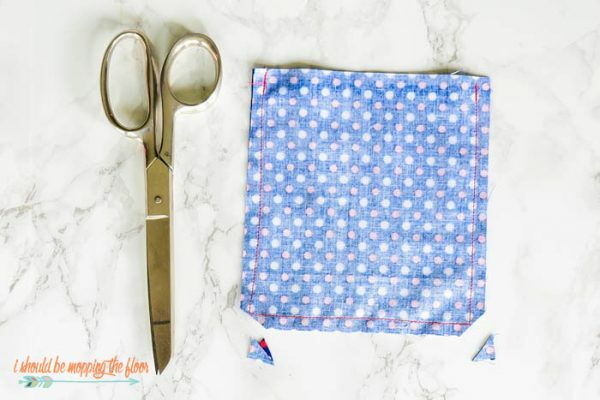 This is a sewing project that is perfect for beginners…or even kiddos who are learning to sew (with an adult’s supervision at the machine). 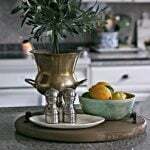 I make gobs of quilted coasters and love to keep them on hand for simple gifts. 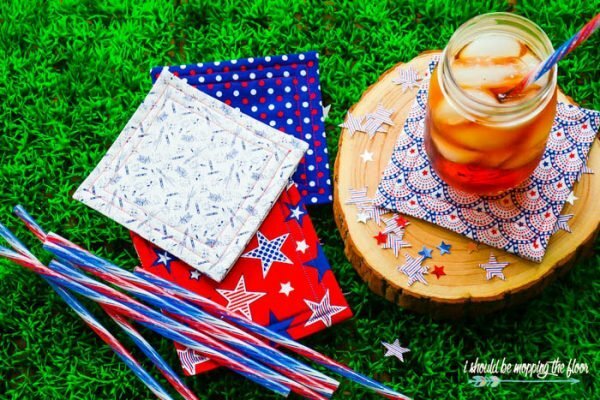 These fun Quilted Patriotic Fabric DIY Coasters just scream SUMMER BBQ! 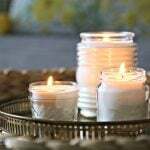 Be sure to take a set when you’re invited to a cookout this season…your hostess will love them! I’m so happy with how these fabric coasters turned out. 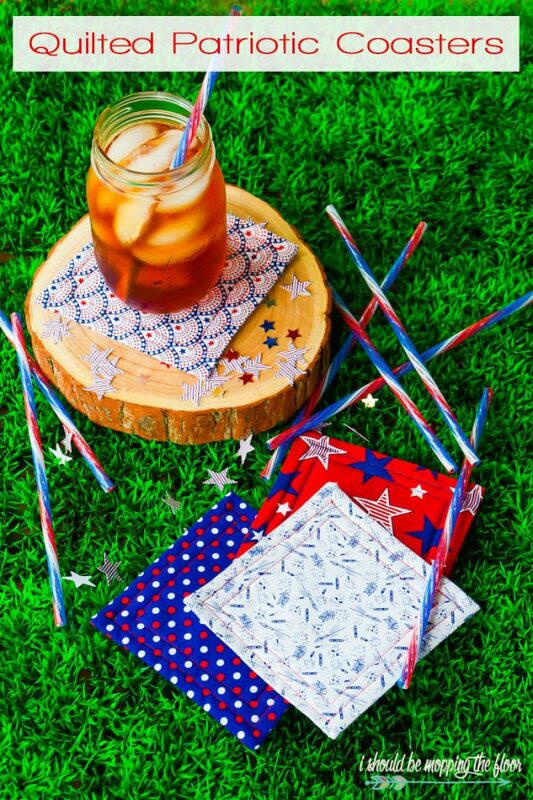 I love adding red, white, and blue wherever I can…and under a cold beverage is the perfect spot (because nothing screams summer like a cold drink!). 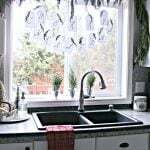 This is a wonderful project to use up fabric scraps. 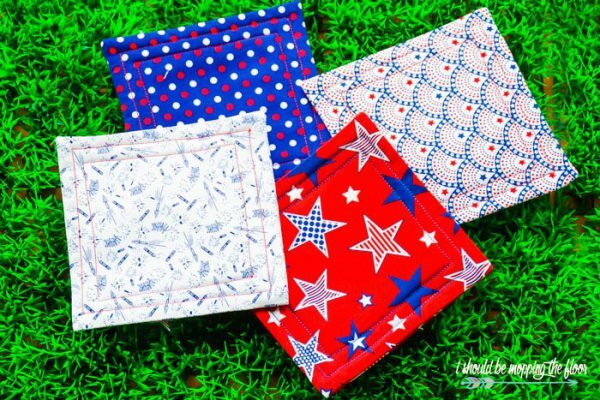 I did grab this packet of patriotic fat quarters on a recent trip to the fabric store. I originally wanted to make a rag wreath, but ended up going for these coasters instead! 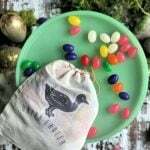 You could use a pack of charms for this, but the coasters will be a bit smaller than mine (charms run 5″ square and I cut my squares at 6″x5.5″, so you’ll need to take that into consideration). To keep things simple, I use simple felt rectangles for my batting…no need to buy the big package of quilt batting for this one. I grab my felt pieces at the Walmarts for like $.30 each. You’ll also need some coordinating thread. 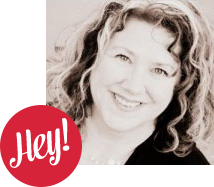 Just a little hint…I use one color in my bobbin and the other in my spool on top. Then I have red on one side of the coaster and the blue on the other. 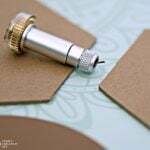 It makes it easy not to have to fill multiple bobbins (I loathe bobbin filling). If I want the contrasting color to show, I just flip the coaster over. You’ll also need your sewing machine for this one. 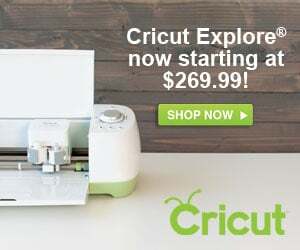 If you have a mini hand sewing machine, that will work great, too. We’re only using the basic stitch on these. 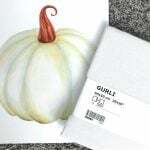 Like I mentioned above, I do a 6″x5.5″ square for my initial cut (it will form a perfect square once it’s all sewn up). Each coaster requires two of the 6″x5.5″ squares and one felt square. I cut my felt into 4.5″ squares. Start by placing your fabric right sides together on your coaster (no felt needed, yet). 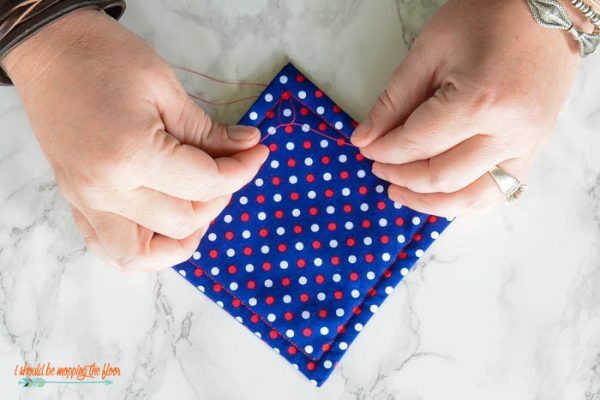 Using the basic stitch on your sewing machine, stitch three sides closed with a quarter inch seam allowance (leave one of the shorter sides open, as pictured above). I do a small backstitch at the beginning and end. Clip your two corners so your points will turn out nicely. 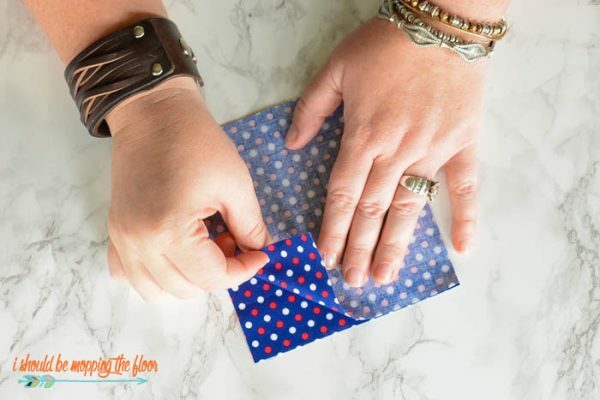 Turn the coaster right side out and gently push out those corners (I use the slanted end of a manicure stick…be super careful not to poke through your fabric). Once your corners look nice, give the whole thing a quick press with your iron. Slide your felt square into your coaster’s opening (this may take a little finesse). You will tuck in the raw edges of the open side of the coaster. Tuck in enough so the entire coaster is a perfect square. 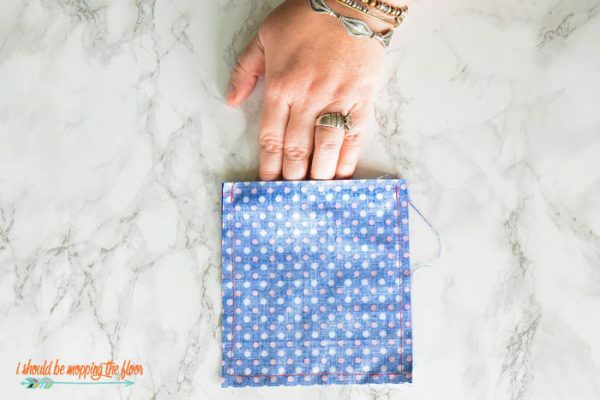 Press this tuck in place so it’s easy to sew. Then head back to your sewing machine (basic stitch again). You’ll be sewing around the entire perimeter (sewing closed the open side), using a quarter inch seam allowance (see below). 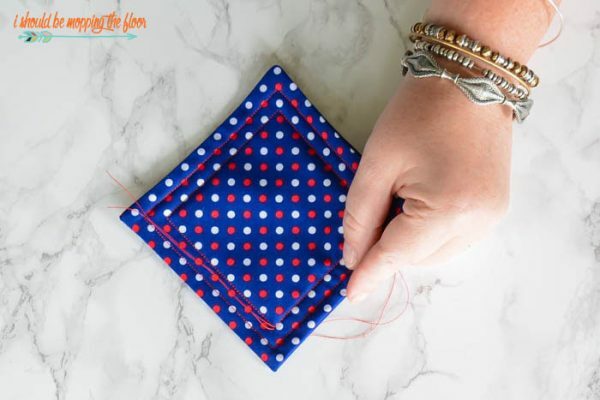 After you do the initial sewing around the edge (well, within a quarter of an inch from the edge, technically), you’ll repeat with another stitch, another quarter of an inch inward. This gives you that nice quilted border…and a nice big square in the middle for a drink to sit on. I do not do any backstitching on these quilted seams. I feel like it makes them untidy. Instead, I keep my beginning and ending threads longer so I can tie them together when removing the finished piece from the sewing machine (see below). Simply tie off with a double knot and snip off the threads as close as possible to the knots. 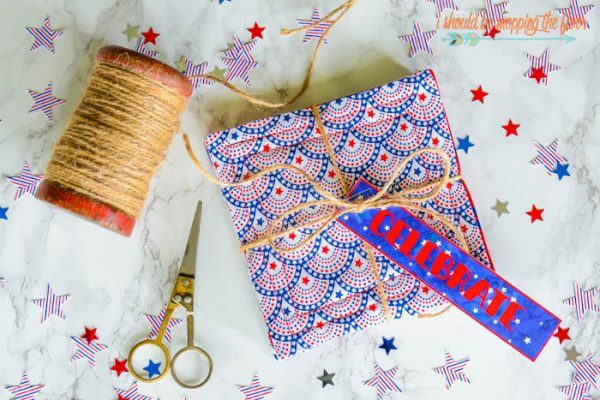 Pretty sure that vintage fireworks print is my absolute FAVE! 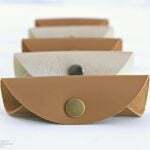 You can even play around with these and do a different fabric on each side. 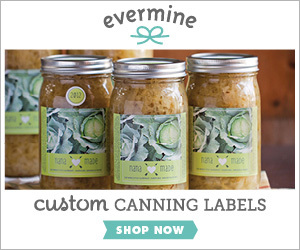 Bundle them together with some twine for a lovely hostess gift at summer parties. 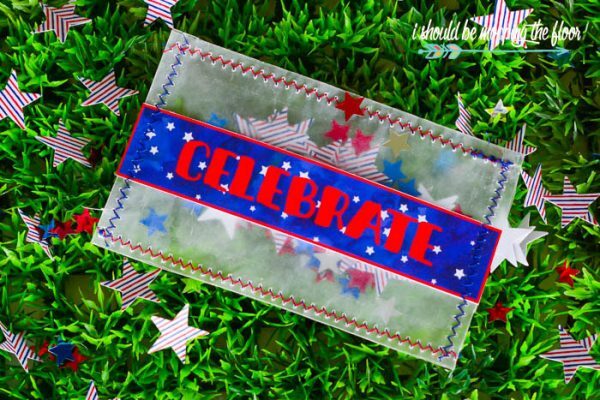 I used the free printable CELEBRATE tag from my blog for the tag on the coasters. 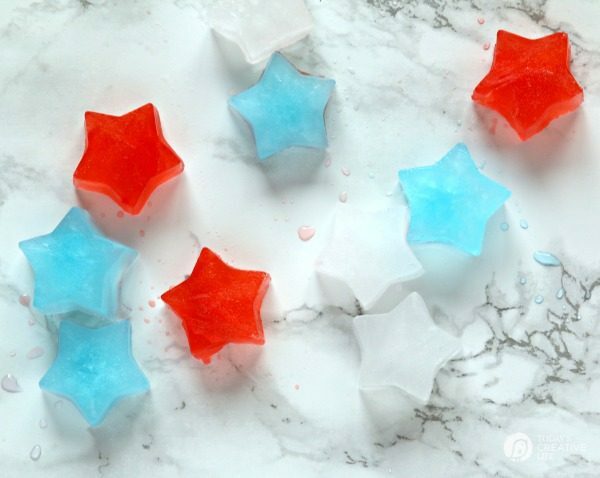 They were a part of my Patriotic Glassine Confetti Packets tutorial. 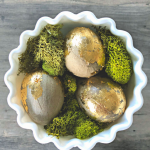 Click here to grab that free printable (and for this project over on my blog). 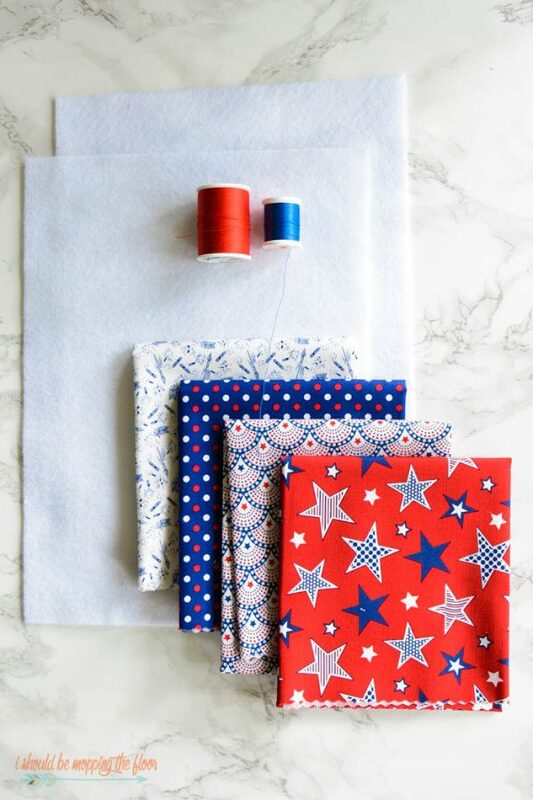 Are your ready for all of the red, white, and blue FUN? 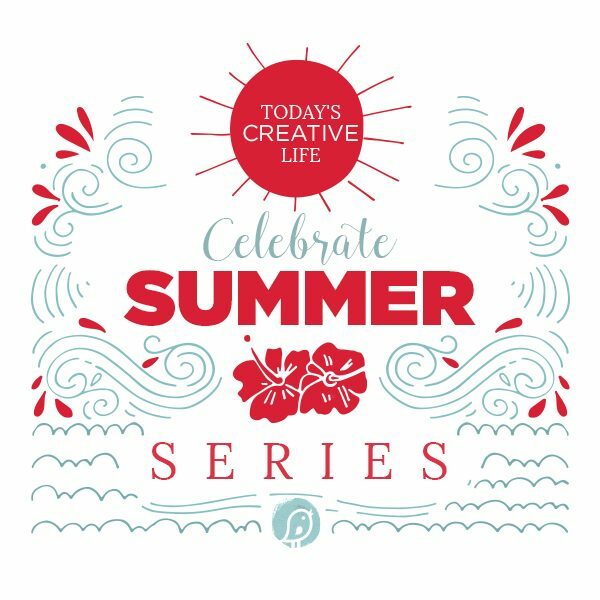 Thanks so much for having me here at Today’s Creative Life, Kim! It’s always such a pleasure to hang out with your readers. 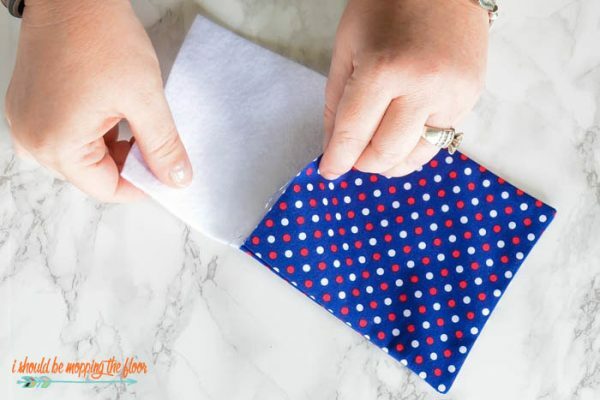 For more projects like my easy to make Quilted Patriotic Coasters, click here to head over to ishouldbemoppingthefloor.com.